How much can you play the system and still be a good guy? Is it okay to bribe, cheat, and defraud your way to the top, as long as you help out a few other people along the way? That's the question clearly presented by Mani Ratnam's new film, the rambling bio-pic Guru. What is less clear is what answer the viewer is meant to take away. 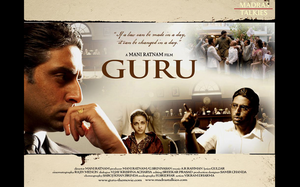 Guru spans decades in the life of its titular character, village bumpkin Gurukant Desai (Abhishek Bachchan), as he builds himself an industrial empire and fights off friends-turned enemies who try to take him down. Early in the film, Guru marries Sujatha (Aishwarya Rai), a feisty girl from his village; her father is offering a handsome dowry, and Guru wants the money to set himself up in business. Guru ends up truly in love with Sujatha - their sweet, spicy romance is one of the film's strengths - but his marriage is far from the last time that Guru uses morally questionable means which he attempts to justify with beneficial ends. He makes a name for himself by taking on the corruption that keeps the Bombay textile business a closed shop, and quickly establishes himself first as an importer of polyester and later as a manufacturing mogul. But he achieves those successes with the help of an influential newspaper publisher Manik Das Gupta (Mithun Chakraborty), and when Das Gupta starts to feel that Guru has taken advantage of the editorial power of his newspaper, an epic battle is begun. Das Gupta deploys an ace investigative reporter, Shyam Saxena (Madhavan), who begins to uncover bribes and accounting irregularities that have fueled Guru's own meteoric rise. Slowly the pillars upon which Guru's empire stands begin to crumble. The film's title implies that Guru has something to teach us about how to do business, how to confront our enemies, and how to interact with bureaucracy. But the film's ultimate bias in favor of its hero leaves us cheering for a man who apparently falsifies business records to evade taxes, bribes officials to turn a blind eye on his accounting irregularities, and has his friends in the press publish false accusations about his business enemies. A subplot about Manik Das Gupta's granddaughter Meenu (Vidya Balan), a lovely young woman suffering from MS, attempts to restore balance to the story; she serves both as a bridge that keeps Guru and Das Gupta connected no matter how bitter their battles become, and also as a means for demonstrating the reporter Saxena's tenderness and humanity. Ultimately, though, the film cheats in favor of Guru just like another bribed official, and the viewer is left puzzling over the film's troubling message. In spite of the peculiarities of its moral, though, Guru is nevertheless a very enjoyable film to watch. It excels in many technical aspects. Virtually every actor shines, especially Abhishek and Aishwarya. Mani Ratnam enjoys a reputation for extracting stellar performances from middling actors, and he demonstrates this power in Guru, allowing his stars to showcase the best of their ability. Individually they effectively conveyed their characters' arc from dreamy innocence through world-weary strength, and together lit up the screen with both tenderness and passion. This stands in stark constrast to JP Dutta's Umrao Jaan, released just two months before Guru, in which this this same pair , presented in a supposedly epic romance, fizzled and fell flat - Aishwarya lay about looking pitiful with bloodshot eyes, glycerine tears streaking kohl down her cheeks, while Abhishek displayed as much life as a plywood plank and about as much range. The director makes all the difference. The side actors, too, gave energetic and believable performances, especially Mithun Chakraborty, whom I think of as the disco hero of the 80s and have never seen play a grown-up part; I would now like to see him in more roles like this one. And A.R. Rahman's soundtrack includes a few sparkling, textured, and just plain catchy songs, especially "Tere bina," beautifully and colorfully picturized on Abhishek and Aishwarya and hordes of dancing villagers. The film was beautifully shot as well, especially the songs, which washed the screen with bold and saturated color. All of this contributed to the film's entertainment value, and it was indeed quite enjoyable as it was happening. But questions linger once the house lights come up, and the viewer is left wondering what message Guru is trying to send.